There’s a big systems win to be found at the intersection of public health and urban design. There’s an even bigger win to be had by adding climate change and social justice to the picture. Doctors and public health officials are beginning to talk about urban design as determinant of health, and this way of thinking has the potential to change communities for the better. 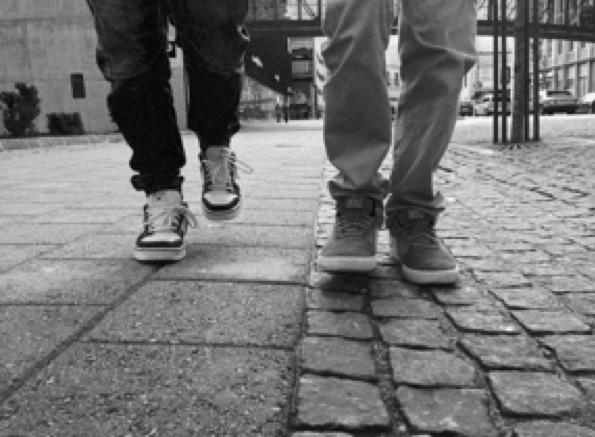 “If we design walkable neighborhoods, more people will walk. We know that if we have good, safe bicycling infrastructure, then more people will cycle,” says Dr. Karen Lee, a public health advocate in New York City. Safe and inviting opportunities to cycle and walk are clear opportunities for reducing health care costs while increasing people’s level of health and quality of life. That’s a pretty strong systems story to begin with, and urban planners and health experts are increasingly collaborating to take advantage of the health-promoting potential of good urban design. But there’s a bigger system’s win to be had, if only we’d expand our view. The same changes that get people out of their cars and onto pedestrian walkways and bike paths also reduce planet-warming greenhouse gas emissions. The right strategies can make people healthier today while protecting the climate of the future. Two scenarios constructed for the city of London show that, some of the time, what’s good for the climate can be good for people’s health as well. 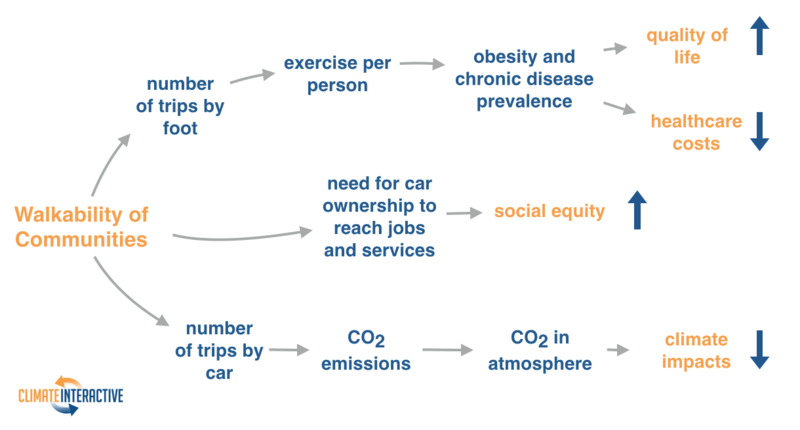 One scenario focused only on climate by encouraging efficient vehicles. The second scenario looked at a more systemic solution: investments that would make the city more friendly to walking and biking. The climate benefit of both scenarios was about the same – a roughly 35% reduction in emissions from transportation. But when it came to the health benefits the two scenarios were not created equal. 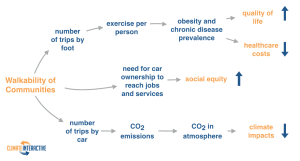 In the efficient vehicles scenario premature deaths were reduced by about 17 per million people, while a more walkable London would see 530 fewer premature deaths among those same million people. The benefits of walkable communities aren’t limited to health and climate. Investments that enable walking and biking also increase social equity, because they benefit everyone, not just those who are able to afford a car and in possession of a driver’s license. Walkable streets give everyone better access to jobs, schools, shopping and healthcare. Healthier people, lower healthcare costs, more social equity, and reduced greenhouse gas emissions: four benefits for the price of one investment. In times of tight budgets and urgent challenges, systems opportunities are the biggest opportunities of all.